Image courtesy of Jonathan Findlay and Southern Power Media. Windy conditions served up a Saturday night contest that was closer than it appeared on paper. 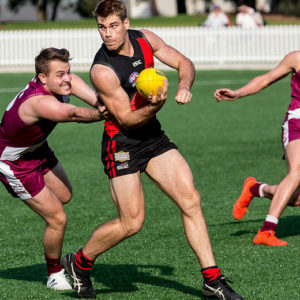 The scoreboard tells that the Bulldogs won convincingly with a five-goal, 30-point victory over the Southern Power at Waratah Park. However watching the game, it was a much closer affair with the Power contesting the match right up until the final siren. It was a special night for the Power for a number of reasons. Firstly, the club used the occasion to celebrate Sir Doug Nicholls Round. The night included a pre-game Welcome to Country, smoking ceremony and the players wore special Indigenous jumpers designed by their star-forward, Rheanna Lotter. Secondly, it was also the return game for Kristy De Pellegrini who had spent 12-months on the sidelines with multiple injuries. The Power had the wind in the first quarter and started strongly. However, despite having 11 inside 50s, the Power was unable to capitalise on the scoreboard. Bulldogs defender Sandra Janjetovik mopped in defence and Meagan Kiely found plenty of action, clearing the ball from the dangerous area on a number of occasions. Bulldogs forward, Shani Lauf kicked the first two goals of the game. The first came from a free-kick after she received high contact 15 metres out, straight in front. The next came in the second quarter from a little toe-poke through from 10 metres out, beating two Power defenders. The Power did their best against the wind, but the ball was continually chopped off by the Bulldogs in the middle of the ground. Defender Alison Parkin and midfielder Kiely took a number of intercept marks and kept their team’s momentum going forward. 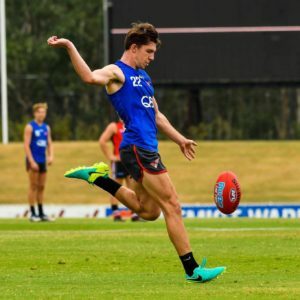 Bulldog Sera Kaukiono then got involved, kicking the next goal from a long way out. The utility received a free kick near the centre of the ground and roosted the ball to the pack at the top of the square. However, a timely gust of wind carried the ball over the pack and through for her team’s third goal. The Bulldogs went into the half-time break with a 20-point lead. Coming out after half-time the Power again looked dangerous with the wind. Brooke Curren lifted in the midfield and was helped by winger Jenna Miller. They were able to get their first goal on the board through a set shot by Lotter on the boundary. UNSW Eastern Suburbs regained composure and took control in the second part of the quarter. Their fourth goal for the game came through a clean gather by Peri Maniakis, who quickly got boot to ball and kicked the ball through from 15 metres out. The Bulldogs finished the game with the wind. Ingrid Nielsen, who had an exceptional game in the ruck, continued to impress, often gathering her own taps and kicking long into their forward-50. Nielsen did this again in the final term and on this occasion, it landed in Roxy McGee’s hands to give her a shot at goal 25 metres out. McGee made it look easy and put through her side’s fifth for the game. 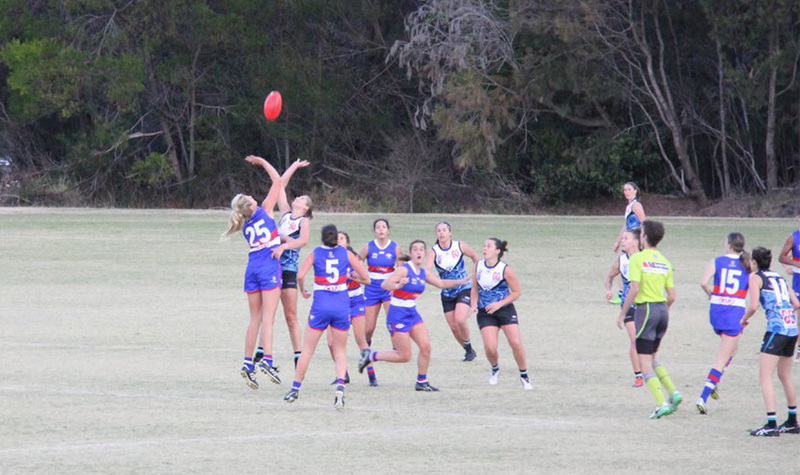 The Bulldogs scored one more goal in the final term through Emma Phillips to win the match by 30-points. Bulldogs Coach, Tracey Kick was pleased with her side’s game. “I was happy with the team’s performance. Only eight players from our 2017 Grand Final winning team were in Saturday’s team and we were missing seven regular players, said Kick. “The team also featured a couple of first time Premier Division players and three 18-year-olds. So some inexperience in there. “Our backline was sensational, especially Alison Parkin playing off half back, she had a big impact on the game. 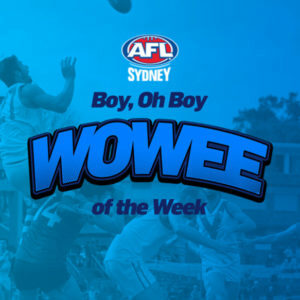 Around the grounds, the Auburn-Penrith Giants (4.5.29) defeated the Western Wolves (1.5.11) and Newtown (5.11.41) beat the UTS Shamrocks (3.5.23) by 17-points. Finally Macquarie University (7.10.52) defeated Sydney University (2.1.13). Phoebe McWilliams is a current AFL Women’s player, recently signed by the Geelong Cats after two years spent with the GWS GIANTS. McWilliams is also a freelance writer for publications such as Inside Football Magazine. 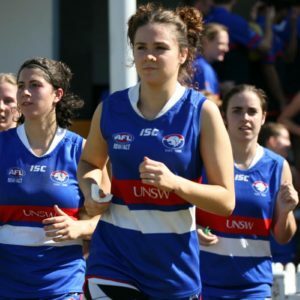 Following the 2018 NAB AFL Women’s season, McWilliams is playing for Hawthorn in the Swisse VFL Women’s competition in Victoria, while writing for AFL Sydney.